In the face of death, our parish responds with a ministry of consolation extending prayerful compassion and service to those who have suffered the loss of one whom they love. Our staff and volunteers are committed to helping you and your family during this most difficult time. The information below is to assist you in planning your loved one’s funeral. Normally the music is chosen by the Director of Music Ministry and the music is provided by the Memorial Choir and cantors. However, If you have any special musical requests please share them with the Director of Music Ministry for approval. At the Funeral Mass there are three readings. The family of the deceased loved one may select the first and second readings, if they so choose. For your family’s consideration, we have linked the funeral readings below. Please choose one reading from the Old Testament readings linked here and one reading from the New Testament readings linked here. If the family has no preference, our staff will be happy to select the readings for you. Your family may choose to host a catered luncheon for family and friends following the funeral. Our parish has a Funeral Luncheon Committee that can help you with the planning of this event. 1. Memorial Mass: one of the most common ways for Catholics to remember their loved ones is by having a Mass offered in memory of the loved one. Mass Intentions can be sent to the Parish Office. The suggested offering is $10. 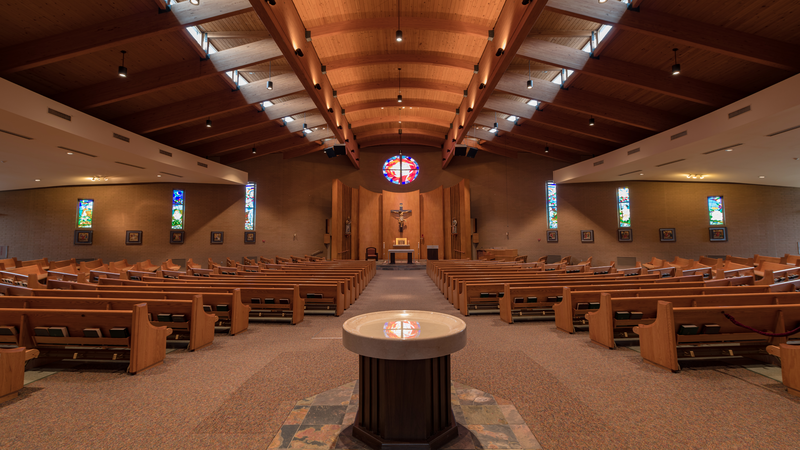 Please be sure to include the name of the person for whom the Mass is to be offered and your contact information. 2. Hymnal: you can memorialize or honor family or friends by making a $20 donation to the parish. A memorial book plate will be placed in a new parish hymnal. Contact Marisa Cazden with your request. 3. Liturgical and Parish Needs: for larger donations, families and friends choose to honor a deceased loved one by purchasing vestments, altar cloths, and other needed items. Contact Father Dan Blout, Pastor to inquire about the current parish needs. 4. Memorial Walk Brick or Border Plate: you can memorialize or honor family or friends by purchasing a Memorial Walk Brick or Border Plate. Bricks and Plates are customized with your memorial. Click here for details and request form.